There may still be a few days left of February, but cycling’s spring classics begin this weekend with the Omloop Het Nieuwsblad on Saturday. All the main characteristics associated with the spring classics are here – cobblestones, Belgian setting, short steep climbs and cold temperatures. Weather forecasts also indicate the possibility of rainfall, which would give the race the full gruelling, mud-drenched spring classics experience. That was the case last year, when Team Sky’s Ian Stannard overcame tough conditions to win the first classic of his career; the image of him grimacing as he crossed the line with a mud-caked jersey and arm and leg warmers covering all his flesh goes some way to showing what that day’s racing was like. Stannard rides again this year, although it remains to be seen whether he’ll lead Team Sky with Bradley Wiggins also selected. But with Wiggins’ main target – Paris-Roubaix – still over a month away, the world time-trial champion may adopt more of a support role in order to build up his form. Another factor in Stannard’s favour is that Het Nieuwsblad is more similar to the Tour of Flanders than it is Paris-Roubaix, and Wiggins is aiming to only win the latter. 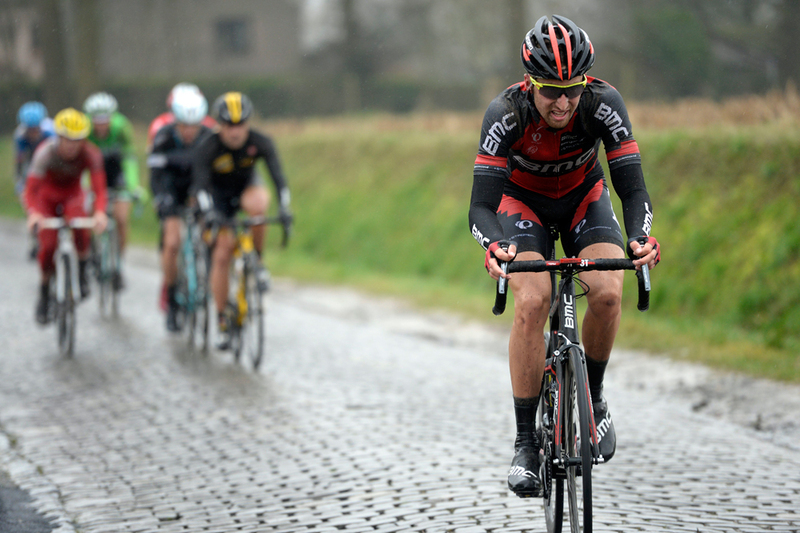 Whereas Paris-Roubaix is flat, many of the climbs that feature at the Tour of Flanders are also included in Het Nieuwsblad, such as the Taaienberg, Valkenberg and the Molenberg. Then there’s the iconic Muur van Geraardsbergen, which used to be the highlight of the Tour of Flanders before being removed in 2012, and continues to enliven Het Nieuwsblad. The frequency of climbs usually ensures that only a small group of riders are left to contest the finish, making Het Nieuwsblad one of the most competitive races in spring. Here’s some of the riders we expect to be up there. Etixx-QuickStep possesses the resources and talent for the spring classics that no other team can come close to, yet it hasn’t managed to win Het Nieuwsblad since 2005. Plenty of its A-listers such as Tom Boonen and Zdenek Stybar are set to attempt to put that right, but last year’s Paris-Roubaix winner Niki Terpstra looks its best bet, following his overall victory at the Tour of Qatar earlier this month. Second place in last year’s edition kicked off an impressive season for Van Avermaet that saw him go on to finish second at the Tour of Flanders and fifth at the World Championships, but that result also revealed the Belgian’s flaw for not winning as many races as he should – despite being a faster finisher than Ian Stannard, he lost out to the Briton in a two-man sprint. Victory this year would help eradicate doubts that he lacks a winning mentality. What felt like a breakthrough victory for Stannard in last year’s edition was unfortunately followed by a crash that prevented him from competing the cobbled monuments. He’ll be hoping to start his 2015 classics campaign with a successful defence of his title, although it remains to be seen how much he will have to share leadership duties with Bradley Wiggins. It’s three years now since Vanmarcke’s surprise victory at the 2012 Het Nieuwsblad, and since then he has gradually developed into one of the very best classics riders. The Het Nieuwsblad is perfectly suited to his characteristics, and with frequent-antagonist Fabian Cancellara not riding he goes into the race as a major favourite. Perhaps the most on-form rider in the peloton is Alexander Kristoff, who has been racking up wins in the Middle-East at the Tour of Qatar and Tour of Oman. Victory at Het Nieuwsblad may however be beyond him, as the race rarely comes down to a large-group sprint, and few will be willing to work with him in an attack due to his superior pace. No live TV coverage is scheduled.